For most of us, hacking is a hobby, something to pass a few idle hours and satisfy our need to create. Precious few of us get to live the dream of being paid to tinker; most of us need some kind of day job to pay the bills and support our hacking habits. This necessarily creates an essential conflict, rooted in the fact that we all only have 24 hours to spread around every day: I need to spend my time working so I can afford to hack, but the time I spend working to earn money eats away at my hacking time. That’s some catch, that Catch-22. From that primary conflict emerges another one. Hacking is a hugely creative process, and while the artist or the author might not see it that way, it’s true nonetheless. Unless we’re straight-up copying someone else’s work, either because they’ve already solved the same problem we’re working on and we just need to get it done, or perhaps we’re just learning a new skill and want to stick to the script, chances are pretty good that we’re hitting the creative juices hard when we build something new. And that requires something perhaps even more limiting than time: inspiration. How you manage inspiration in large part dictates how productive you are in your creative pursuits. Do you want to use your time more productively but are tomato-averse? [Robin]’s LED Pomodoro timer could be the perfect hack for you. The Pomodoro Technique is a time management solution developed in the late 1980s. The basic idea is to spend a very focused 25 minutes performing some activity such as working or studying and then take a 5-minute break. Many of its proponents use a tomato-shaped kitchen timer to alert them to switch between the two states, but [Robin] wanted to make his own and learn along the way. First, he wanted to use an ATtiny85 and learn about its features. Specifically, he used its timers, PWM, and low-power sleep mode. [Robin] used Charlieplexing to drive a total of six LEDs. When the timer starts, five yellow LEDs are driven high to indicate each 5-minute slice of work time. A red LED is lit during the 5-minute break. [Robin] also explored compact PCB design and fabrication. All components are SMD and his board is 4cm square. 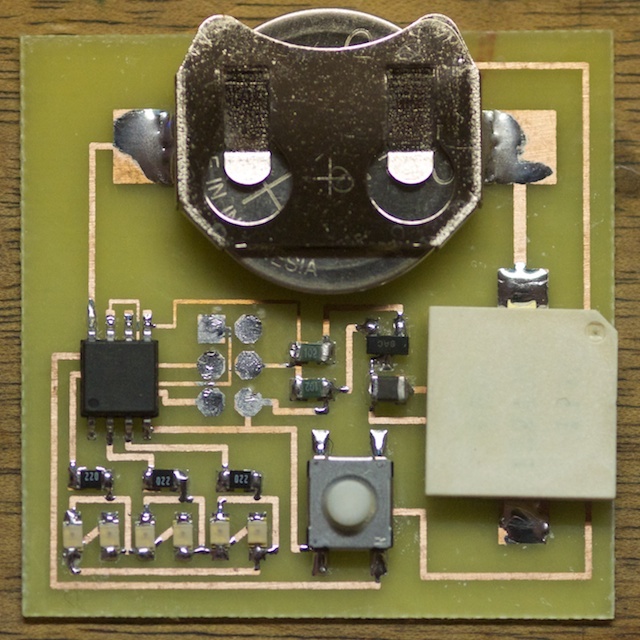 [Robin] is using this SMD buzzer for discrete feedback. He included a footprint for a six-pin ISP header and programmed it with pogo pins. The timer is completely interrupt-driven: one click of the tactile button starts the work counter, and the buzzer sounds when time is up. A second click starts the break counter. [Robin] has made everything available in his GitHub repo and encourages you to use it. Time’s a-wastin’!